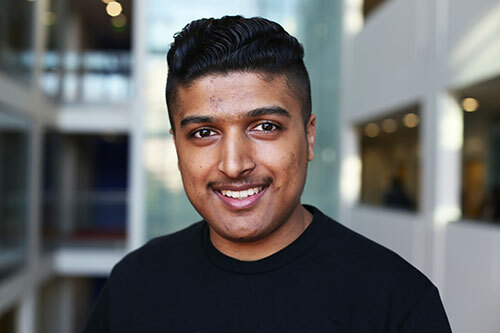 Prem-Rishi is a 3rd year BSc Accounting and Finance student. He chose to study at Cass because it has close connections with the finance industry. Why did you decide to apply to Cass Business School? I applied to Cass because the course structure and the modules offered would provide me with vast knowledge of various aspects of the finance industry. Also, the course is accredited, which allows me to train to become a chartered accountant once I graduate. Cass has connections with many companies within the finance industry. This means there are regularly events where large firms come onto campus to provide insight into the different sectors within the finance industry; this was a big draw for me. What is your favourite thing about studying at Cass and City? One of my favourite things is the diverse cultures within the university, which allows you to meet people from all walks of life. Also, having central London on our doorstep allows us to take time away from studying to enjoy exploring London. Are you planning to do a placement of study abroad year as part of your course? I am currently going through the process of researching and applying to companies for internships and placement years to gain work experience within the finance industry. The contacts that Cass has within the finance industry has assisted me because I am able to gain support from industry specialists with my application. I am also researching and applying for study abroad as an alternative option because Cass has relationships with many universities around the world and it will allow me to experience the culture of another country. The careers and study abroad team has provided me support with my research and application process. Once I have graduated, I plan on going to work in the finance industry within the investment banking sector as a stockbroker. I feel that Cass will help me develop and align my growth and understanding in analytical expertise, nurturing my creativity to expand my insight into financial institutions within the UK and globally. I will be able to challenge my knowledge and understanding, improving my technical and analytical ability to have a versatile career. It will motivate my desire to succeed within a professional career in finance. Work hard, but play harder. I feel that it is important to work hard at university, but to also expand your network through your social life. I think that it is important that you enjoy your life at university and make the most of it because you can look back at your time at university and reminisce about the good times you had with friends that you can have for life.